As a company that designs and manufactures history-inspired fashions, we and our customers are inspired by history! Here is another story from Recollections’ recent trip to Tucson, Arizona. The day dawned bright and sunny. It was a definite (and welcome) change from the cold and clouds I’d left behind in Michigan. It was a day to get out and do something. 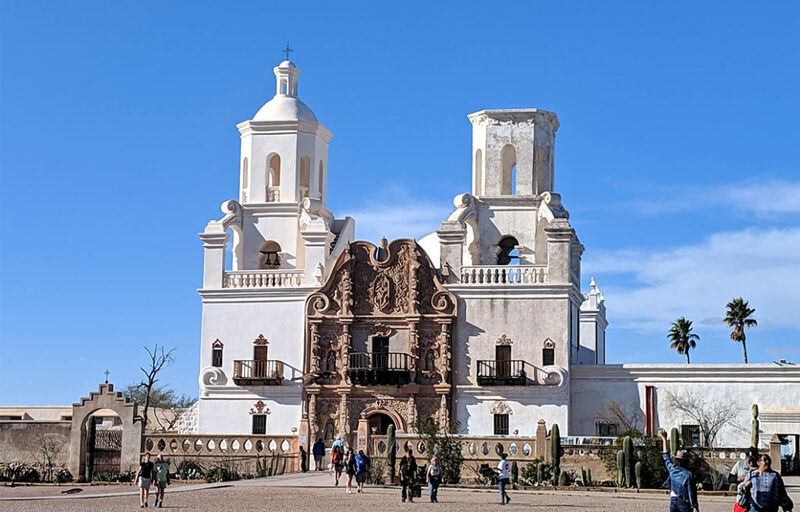 So, my cousin and I decided to experience the Mission San Xavier del Bac, located about 9 miles southwest of downtown Tucson. Since it was the weekend, we expected the mission to be busy but we arrived on the first day of the annual Wa:k Pow Wow, which made it exceptionally busy. It was too late in the afternoon to really take in the Pow Wow but it did bring memories of my childhood. There is Native American blood on our mothers’ side of the family (dating to the 19th-century and we claim no ties to any tribe). My parents would take us to local pow wows in New Jersey so we could learn more about the culture and the people. And so, to the backdrop of Native American music, we began our tour of San Xavier. The church rises from the earth in stark contrast to the surrounding area. Tucson is edging ever closer, but the mission isn’t in danger of becoming the Alamo just yet. It was easy to step back in time and imagine what life was like at the mission during the 1800s. The San Xavier Mission was founded in 1692 as a Catholic mission. The current church was built between 1783 and 1797 and is the oldest intact European structure in Arizona. 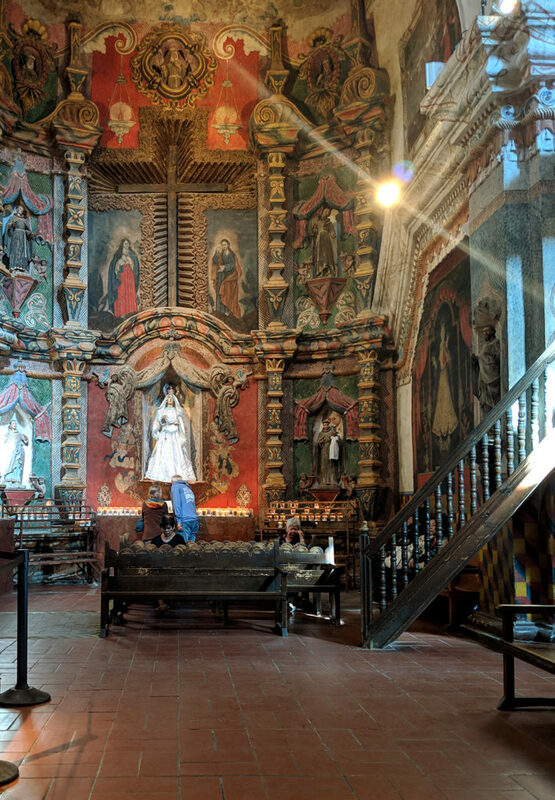 Visiting San Xavier is free to the public. There are times when access to the church is limited because it still serves the local community with religious services. We started our tour in the courtyard area where we looked at a model of the mission. Next, we viewed the video on the history of the mission. This was followed by a visit to the museum. This provided a glimpse into the lives of the people who not only served at the mission, but the people served by the mission. The highlight of our trip was spending time inside the chapel. It is made of fired adobe bricks set in lime mortar. Its shape is that of a Latin cross. The outer walls are painted in white stucco. 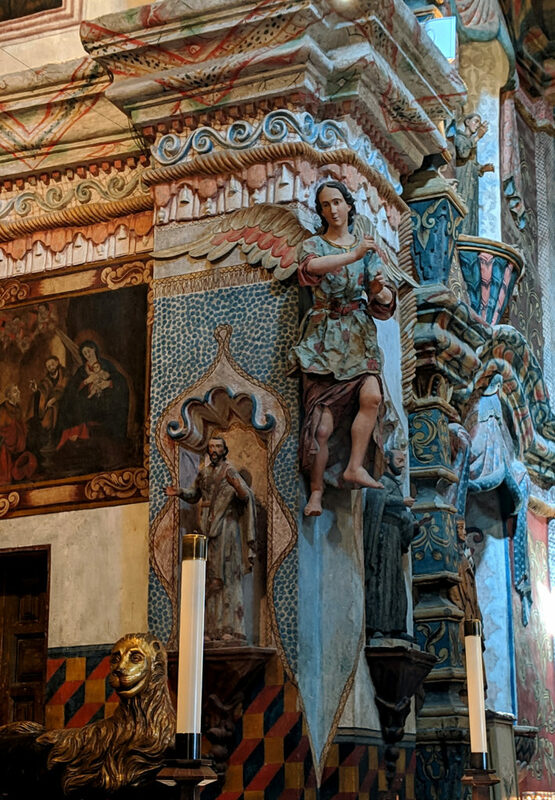 Although little is known about the people who decorated the interior, the workmanship of the artisans who not only built the sanctuary but provided the details is beyond impressive. The love that has gone into the restoration is evident everywhere you look. When you step inside its walls, you are transported back in time. The wooden benches that serve as pews line the center of the sanctuary leading up to the altar. 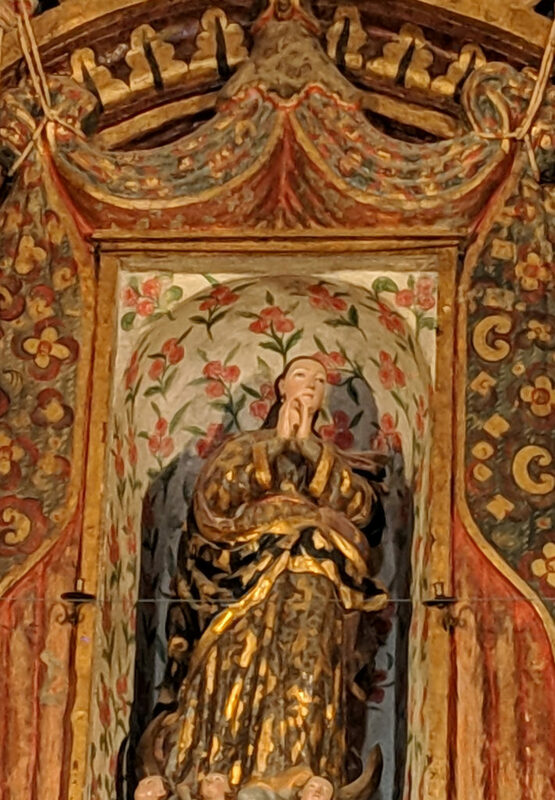 The transept on the east side of the sanctuary is filled with saints, including the first Native American saint, Kateri Tekakwitha. There is scaffolding in the west transept due to continuing restoration work. 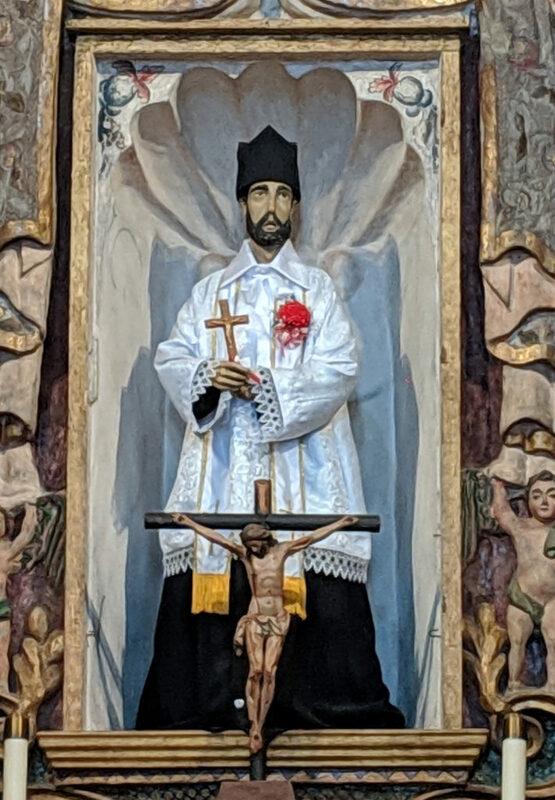 This is where the reclining statue of St. Francis Xavier rests. Then, there is the altar. 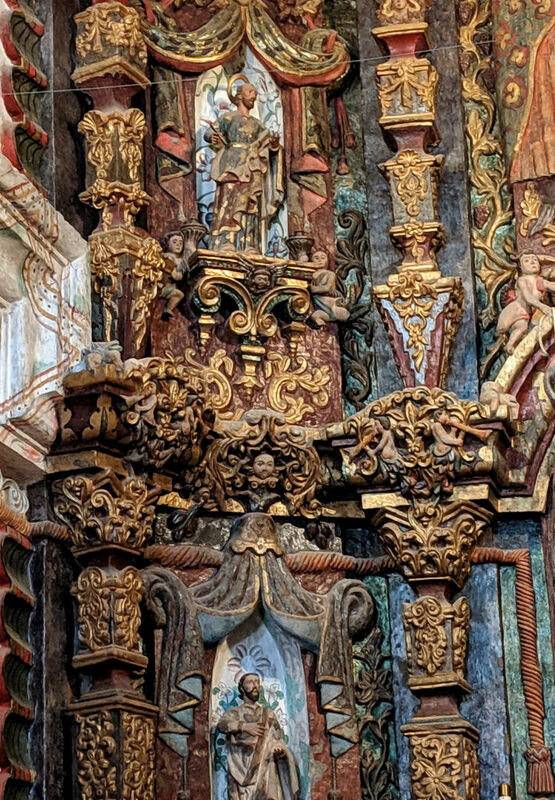 The carved wood that surrounds the altar is unlike anything I’ve seen in a very long time. 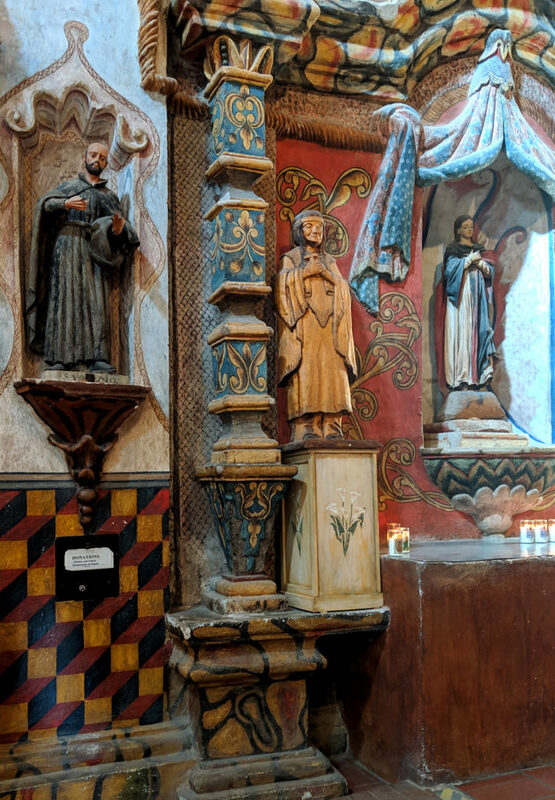 Wooden statues of San Xavier and the Virgin Mary are ensconced behind the altar. 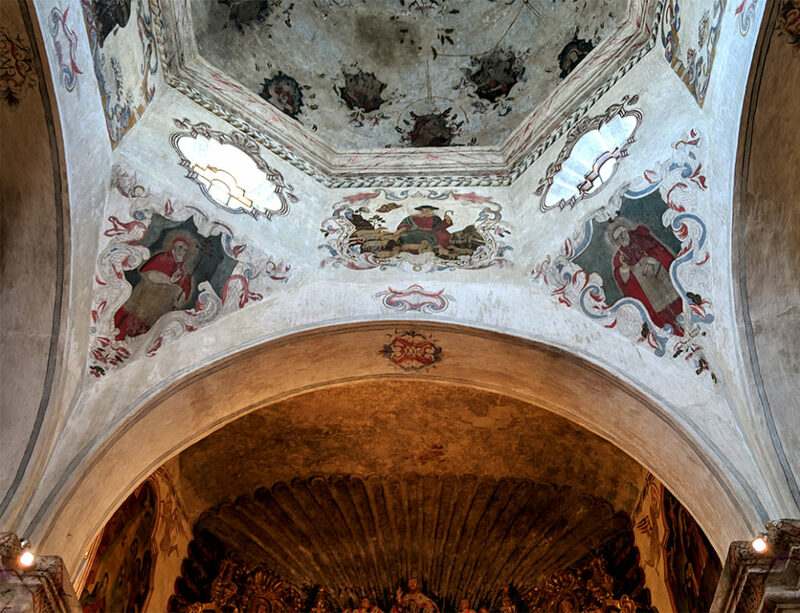 Other religious imagery covers the walls and vaulted ceilings. 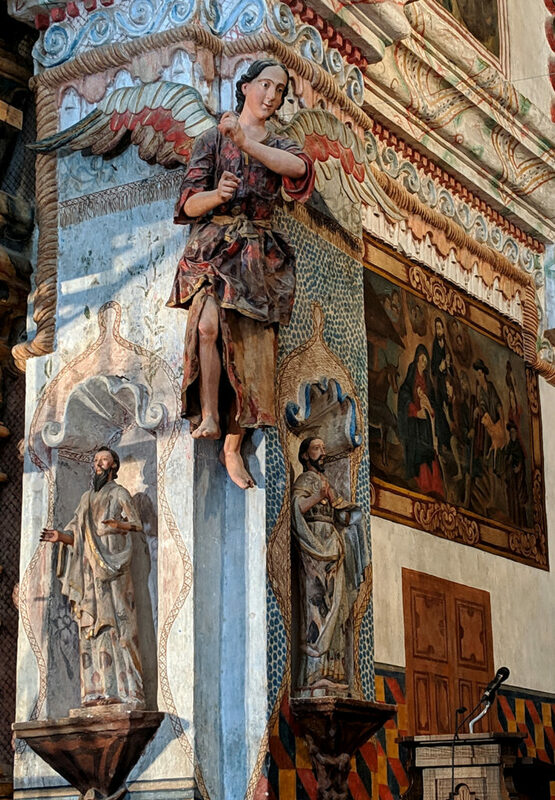 Angels flank each side of the altar, offering a sense of peace and protection. 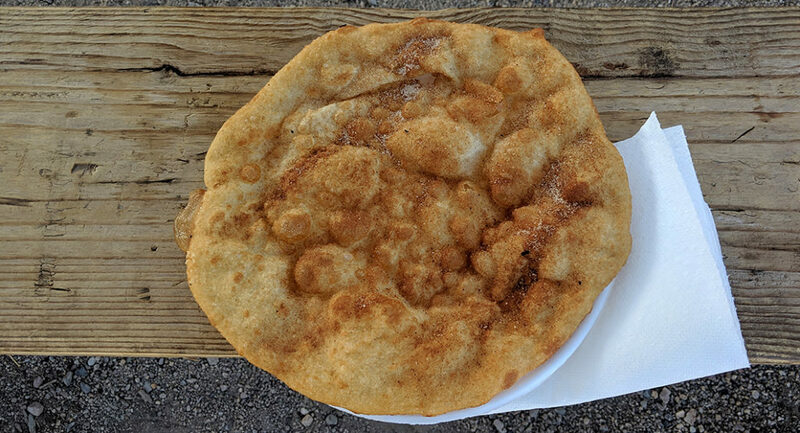 As we walked back to the car, we stopped for some fry bread. 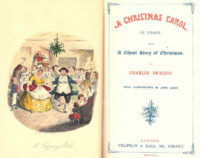 It was as good as we remembered it from childhood. We thought about the powdered sugar version but after envisioning what we would look like when we were done (cute on a 4-year old, not so much on grown women), we opted for cinnamon sugar. If you visit the San Xavier Mission, you may also want to climb the volcano outcropping where you can enjoy the vista. Father Eusebio Kino is the founder of the San Xavier Mission. It is located in an area of natural springs and the Santa Cruz River, at the village of Bac on the Santa Cruz River. The foundation for a church was laid by Father Kino but was never built. The current church was built between 1783 and 1797. It is known as the White Dove of the Desert. 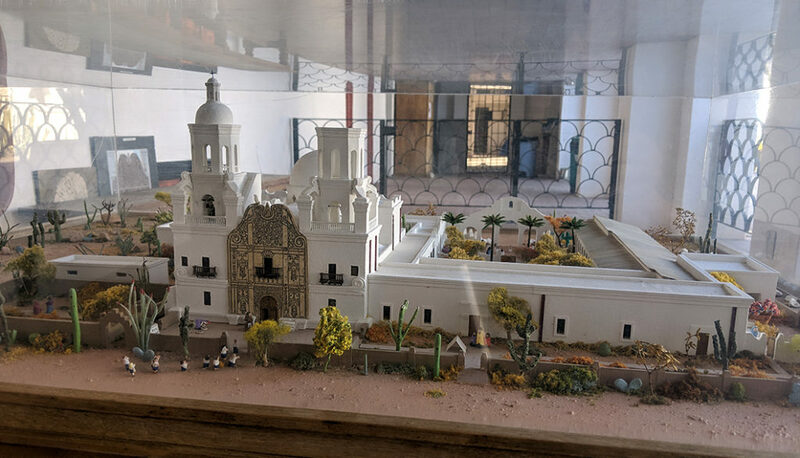 San Xavier became part of Mexico in 1821 when it gained its independence from Spain. The Mission became part of the United States in 1854 through the Gadsden Purchase. The church and the mortuary were badly damaged during an earthquake in 1887. The needed extensive repairs begin in 1905. More repair was needed after lighting struck the West Tower lantern in 1939. That was finally done in 2007 with materials that would not attract lightning. What happened to the East Tower? Here are three legendary theories. Someone fell off the tower, and work was halted. If a building was unfinished, its owners didn’t have to pay tax on it. While all of these sound good, none of them are true. The builders ran out of money. 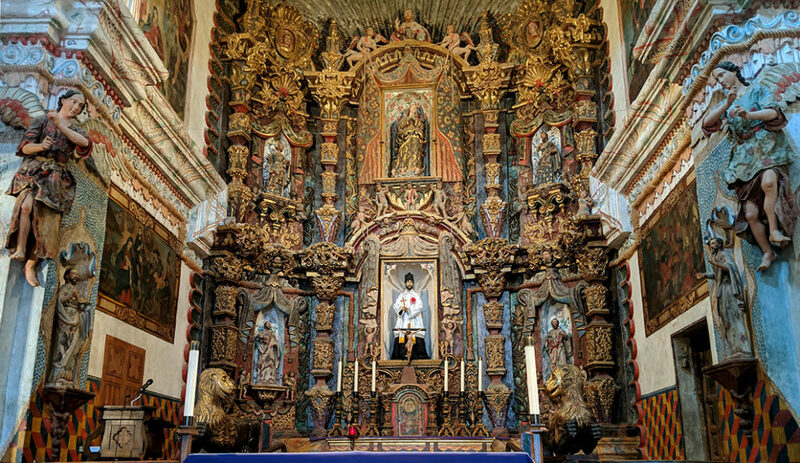 The Patronato San Xavier was founded in 1978 to promote the conservation of the Mission. Conservation continues to this day funded by donations from people like you and me. The mission continues to serve the local community. Only congregants may be married, baptized, etc. in the church. The chapel is closed to the general public during weekly services and on special occasions. While this current edifice was not yet built, the mission existed in 1775. 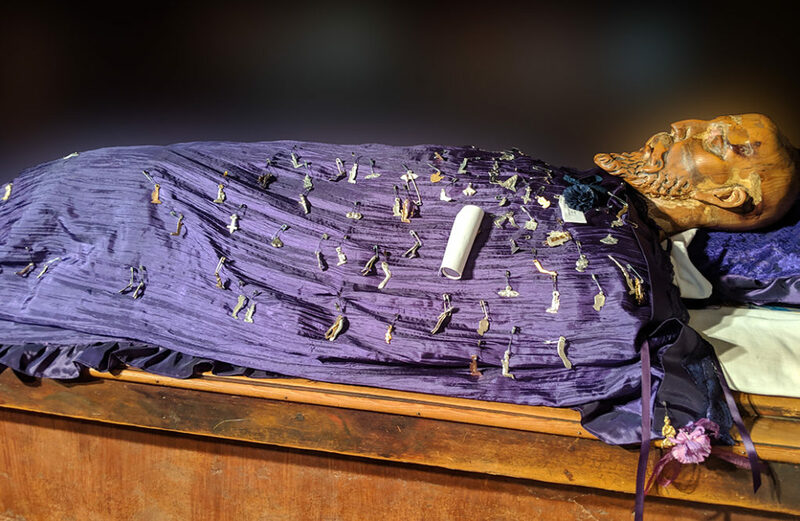 My 5x great grandmother, Maria Ygnacia Manuela Pinuelas, the wife of Corporal Jose Vicente Antonio Feliz, died one day out of the Presidio of Tubac, and she was buried there. She was the only one who died on the Anza Expedition of 1775.